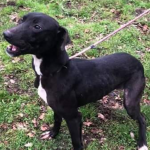 Treacle is a young Lurcher, not yet 12 months old. 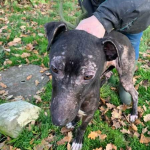 She was abandoned with poor skin condition before Christmas and came into kennels as a stray. She had obviously suffered a great deal of neglect. Fast forward a few weeks with some tender loving care, and she looks as good as new!! 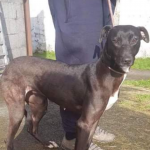 Treacle is full of beans, super people and dog friendly, loves everyone! She has not been cat tested. 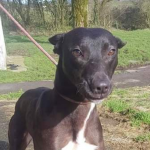 She spent a while in a foster home being assessed and could do with basic training but is keen to learn. She isn’t used to walking on a lead and will need gentle encouragement. She also, quite understandably, has separation anxiety, and we can give you tips on how to handle this to gain her confidence. Because of this she will be best suited to a family where someone is around most of the time, at least to begin with. 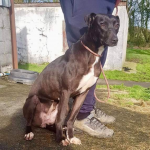 This beautiful young girl would suit a family wanting a loving companion, she’s just a bigger version of a lap dog….or so she thinks! 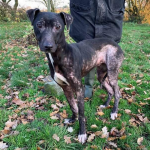 Treacle is neutered and chipped and ready to find her furever family. 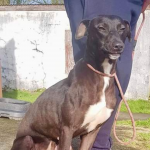 She is in kennels in Carmarthen with West Wales Poundies and will need to be rehomed within a reasonable distance of the rescue for ongoing support etc.